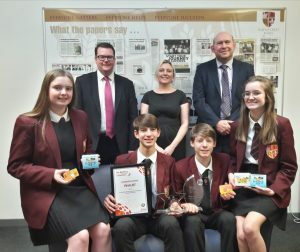 Rainford High received a visit from Conor McGinn MP this week, who met with talented students which recently won a national award in a global health and development competition. Four students in year 11 were crowned winners of the silver category in the Youth Grand Challenges Competition for their invention that persuades children in developing countries to wash their hands. Branded ‘Soap & Suds’, Zach Cunningham, aged 16, Evan Cunningham, aged 16, Rebecca Spencer, aged 15, and Katie Wilkinson, aged 15, came up with the idea of a bar of soap with a game inside it, to help stop the spread of infectious diseases such as pneumonia and diarrhoea by getting children to wash their hands more frequently. The Youth Grand Challenges is a national STEM (science, technology, engineering and mathematics) competition that inspires young people, aged 11-19, to use science and technology to tackle global health issues. Run by the British Science Association with the support of the Bill and Melinda Gates Foundation, it tasks school across the UK to think of innovative ways to mitigate infectious diseases. The St Helens North MP was so impressed by the idea, he has written to the secretary of state for international development, Rt Hon Penny Mordaunt MP, to make her aware of the project and asked her department to help it evolve. He said: “The team have done a brilliant job and are a great example of just what young people across the borough are capable of – especially when they get the right support from their school. Principal of Rainford High, Ian Young commented: “We were delighted to welcome Conor McGinn MP to the school and speak first hand with our year 11 students who have produced Soap & Suds. Rainford High is an 11-19 school with just over 1600 students. The school has a successful sporting pedigree with teams regularly being successful in town, regional and national competitions across a range of sports as well as students receiving representative honours at the highest level.